and most importantly - THE FOOD!!! Fall weather has been hit or miss here this year, but that doesn't deter me from participating in some seasonal baking and cooking. 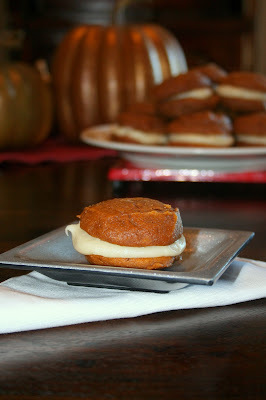 One of the first seasonal inspired items I've baked were these Pumpkin Whoopie Pies with a Maple Cream Cheese Filling. If you like pumpkin you definitely need to try these. They're sweet and spicy, the perfect combination for Fall, and then you add a little maple syrup cream cheese filling and they're positively decadent. In a separate bowl, whisk to sugars and oil together. Add the pumpkin puree and whisk to combine thoroughly. Add the eggs and vanilla and whisk until combined. Sprinkle the flour mixture over the pumpkin mixture and whisk until completely combined. Use a small ice cream scoop with a release mechanism to drop heaping TBSP of the dough onto the prepared baking sheets, about 1 inch apart. To assemble Whoopie Pies:Turn half the cooled cookies upside down. Pipe filling (about a TBSP) onto that half. Place another cookie, flat side down, on top of the filling. Press down slightly so that the filling spread to the edges of the cookie. Repeat until all the cookies are used. Put the whoopie pies in the refrigerator for about 30 minutes to firm before serving. These definitely look great! Can't wait to try them out! I love fall flavors, I definitely can't get enough of them! i am super excited about this recipe...a friend sent it along because i am pumpkin crazy and i'm hosting a big dinner this coming friday and will have these for a fun dessert. how many pies does this recipe make? thanks for sharing! Just found on you "This Week For Dinner." I'm definitely trying the these pies but everything else looks great too! Just added you to my list of blogs I read :-) Keep it coming!